What's more special than our Special Edition stroller? Our new NV Pet Stroller. No zippers means no hassle when trying to open and close the stroller. Our new NO-ZIP technology means that you can easily gain access to your pet without fumbling with difficult zippers. The NV Pet Stroller also features an elevated paw rest. Your pet can easily look out of the stroller by using the front bar for support. This stroller navigates over rough terrain with ease, whether jogging or strolling, thanks to the front locking wheel. 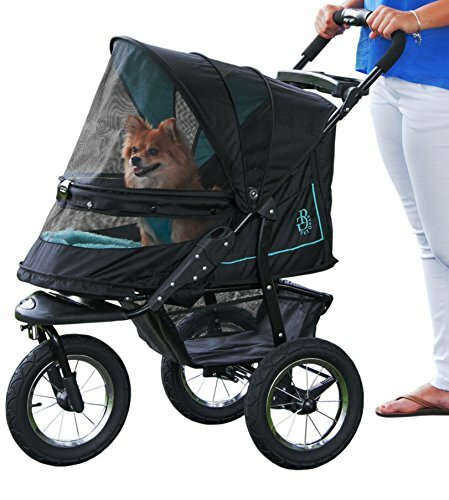 Speaking of strolling, the new panoramic view window allows your pet to remain safe inside of the stroller without missing any sights along the way. This stroller also features a plush bolster pad, air tires for a smoother ride and new stylish colors and embroidery, what more could a pet want? Suitable for pets up to 70-Pounds. Domestic lower 48 free shipping is expedited. We have many different shipping locations depending on the product you buy and the shipping location that you choose. We try to ship most items within 24 hours of payment Monday-Friday. Most orders are in transit for two days but some may take longer. If you have a specific time frame please contact us before you make the purchase.Electronic ProductsOur electronic products are manufactured according to the specifications of the U.S. Electrical Standards and Codes. If you purchase these products to use in a country outside of the United States we cannot guarantee they will work properly. We assume no responsibility if the items malfunction or cause an accident because one tried to use the product with foreign electrical standards. The use of a converter or other voltage transforming device is your own risk.